Definitely not a stretch of the imagination. After all technology, good technology and its effective use is all about innovation. The Harvard Business Review Blog Network has many interesting articles about the role of the CIO and their role in business transformation. One excellent point is “the world of business is not just changing — it’s transforming”. The difference being — change is doing something different but incrementally and transformation is doing something drastically different, for example the move from wax cylinders, to acetate discs, to LPs to CDs to MP3s. The transformation of the CIO role is a move from a total focus on technology to business strategies empowered by technology. As HBR notes, “the old way was information management; the new way is information intelligence. The old way was IT systems management; the new way is platforms which enable new value chains and integrated ecosystems. The old way was cost management; the new way is driving business transformation and accelerating growth”. The CIO’s role must shift from protecting and defending the status quo to embracing and extending new innovative capabilities. In addition to being a part of the transformation, the CIO and their team still have to maintain existing systems, ensure 24/7 availability, perform upgrades and replace ageing software and hardware. The key is to ensure this is not the only thing the CIO should be doing, if this is the sole aim, the CIO is not growing in the role and their relevance will rapidly diminish and become as obsolete as a legacy operating system. This indicates that CIOs prioritise efficiency over delivering strategic value or building relationships with IT customers. Efficiency is necessary and but focussing on internal operations means lost opportunities to develop valuable relationships with colleagues in the C-suite and other key stakeholders. Focussing only on cost reduction and efficiency will devalue the role of the CIO and reduce the relevance of IT in overall operations. According to Gartner, IT budgets have been relatively flat over the last years, at the same time, broader expenditures on technology have increased substantially, so even as technology grows, the scope of IT control and impact is decreasing. Evidence of the growing importance of the Chief Innovation Officer is the Chief Innovation Officer Summit held in key centres around the world and websites dedicated to the role. 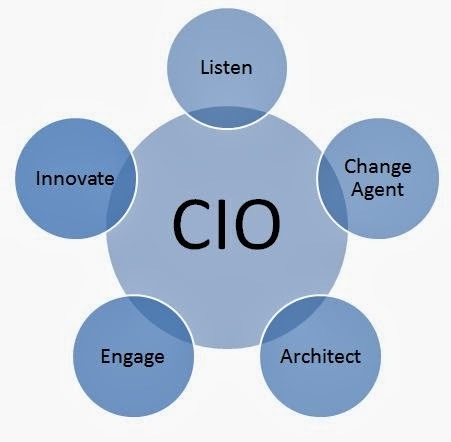 Should the CIO embrace the transformation and assist management by not only supplying the appropriate technology but also the vision and direction to achieve the company objectives using the technology, they will remain relevant and in the ideal position to drive the innovation forward. If you the CIO won’t change your focus, it will be changed for you.